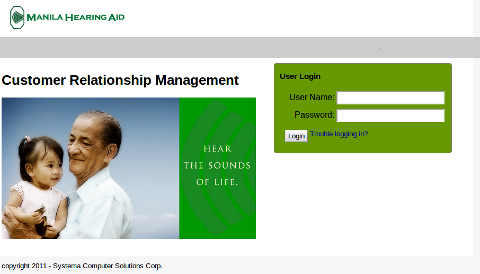 Systema just deployed for Manila Hearing Aid, Inc., a custom google web application to handle their customer relations management. Off the shelf CRM was not a good fit for them because of the unique requirements in the Hearing Aid business. The application was written using GWT/GAE and hosted on the Google cloud. This setup allows MHAI to share the application across their 9 branches without having to have to maintain their own in-house servers and system administration personell. Systema support services keeps the application running for MHAI 24/7.